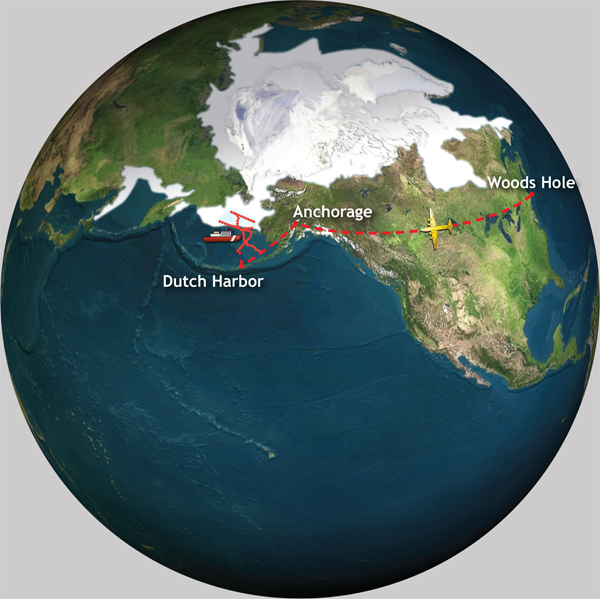 Starting out from 14 different scientific institutions across the USA, including Woods Hole, the scientific team will fly to Dutch Harbor to board the U.S. Coast Guard Cutter Healy, and then zig zag through the Bering Sea. The U.S. Coast Guard Cutter Healy uses its powerful diesel engines to ride up onto the ice and break it under the ship’s weight. Photo courtesy of Tim Sullivan, USCG Healy. 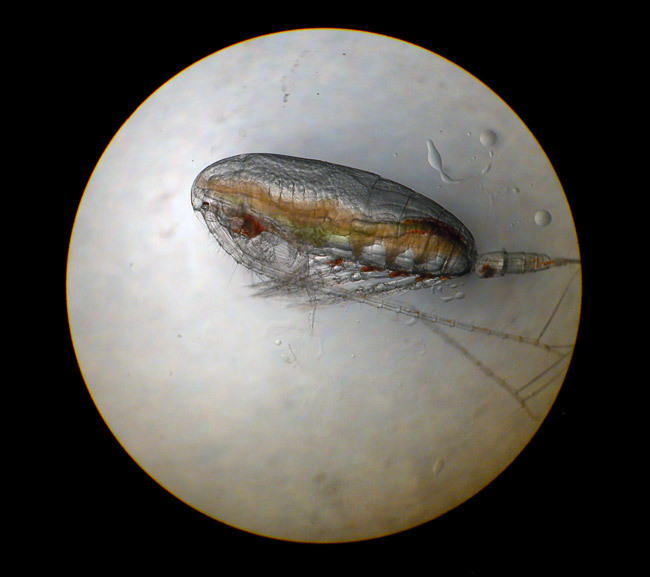 Copepods, like the one above, are a critical link in the Arctic food web. Photo by Carin Ashjian, WHOI. 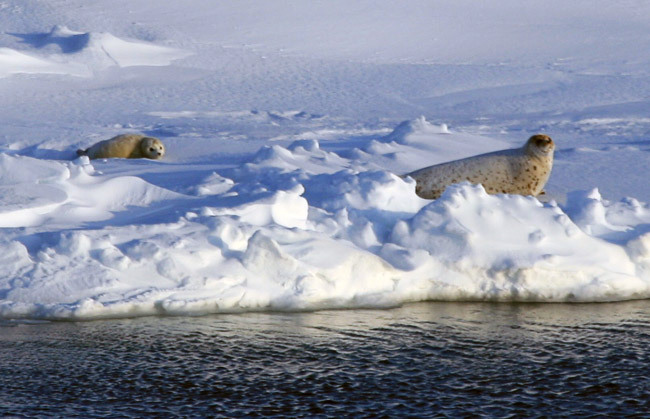 Arctic seals are both predator and prey in the Arctic food chain. Photo courtesy of Tim Sullivan, USCG Healy. How is climate change affecting the delicately balanced ecosystem? On April 3, 2009, the U.S. Coast Guard Cutter Healy will pull out of Dutch Harbor, Alaska, with 41 scientists on board. They'll spend 38 days traversing the Bering Sea, looking for answers to this question. Join photographer Chris Linder and writer Helen Fields this spring as we learn about the scientists' work, how they collect data, and life on the icebreaker. We'll be hoping to catch the ice edge bloom, an event that happens every spring. In winter, the Bering Sea is covered in thick sea ice. As the ice begins to break up and melt, sun hits the open water for the first time in months, providing energy that spurs the growth of photosynthetic marine plants and setting the whole ecosystem in motion. The main focus of this cruise is to learn about sea ice, and how climate change will affect it. As the Earth becomes warmer, the Bering Sea may freeze for a shorter time each winter, or even stop freezing over. This could disrupt the whole ecosystem. Fish could appear at different times or in different places. Whales, seals, and humans could have trouble finding food. As we zigzag through the Bering Sea, researchers will be looking at many parts of the ecosystem. Some will be collecting bottles of water, scoops of mud, or cores of ice to see how much photosynthesis is going on in those places—how much phytoplankton is turning sunlight into energy that will travel up the food chain. Others will be studying tiny animals that swim in the water or live on the seafloor. Still other scientists will spend daylight hours on the ship's bridge, watching for seabirds. The Healy is the Coast Guard's newest icebreaker, commissioned in 2000. At 420 feet, it's also the Coast Guard's largest ship. 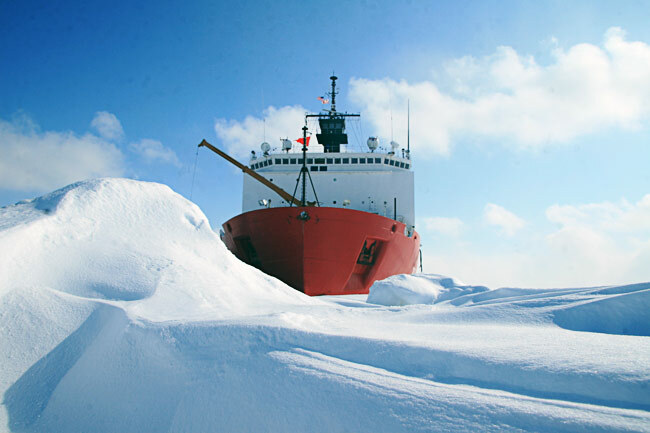 An icebreaker doesn't work by smashing through the ice, as you might imagine. Instead, the Healy uses its powerful diesel engines to ride up onto the ice and break it under the ship’s weight. The Healy's primary mission is research. It has labs, freezers, and staging areas reserved for science. There's also a gym, movies, a coffee shop, and the occasional ping-pong tournament. But the scientists work 12-hour days—or longer—with no days off. These 38 days are the only chance for them to collect the samples and data they need to help answer critical questions about the future of this part of the world. Click here for more on the Arctic Ecosystem. In addition to following along with our daily updates, you can ask questions directly to the scientists on board ship using Polar Mail. But if you'd like to comment about our stories and photos, we welcome you to join our Facebook group.